On October 13th, 1950 a DC-3 aircraft (AAF) that belonged to Orient Airways – now Pakistan International Airways (PIA), crash-landed after three minutes of taking off in Skardu. All of the crew and passengers survived – including famous author James Albert Michener. A resident of Skardu, the late Brig. (Retd.) Mohammed Aslam Khan was greatly inspired by James Hilton’s fiction novel “Lost Horizon.” In the story, an airplane crashes near a river bed. The surviving passengers came across some Buddhist monks from a nearby temple to seek their help, and they took them to a beautiful lamasery which was filled with fruits. The blissful place was called Shangrila in the story, a Chinese word meaning “heaven on earth”. Inspired by the story, and intrigued by the plane crash, Brig Khan decided to create his own Shangrila in Pakistan. He obtained some land close to a lake called Kachura and planted an orchid full of numerous types of fruit. He then bought the crashed plane from Orient airways for Rs. 150 and it took him three months along with hundreds of men, horses, and bullocks to move it to its present location. 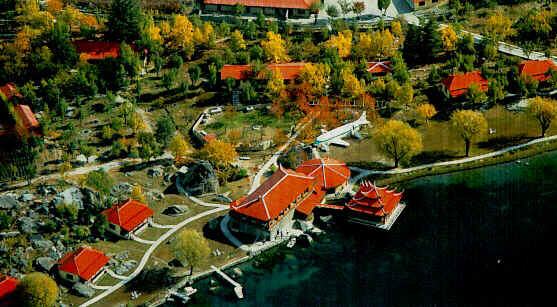 In 1983, Brig Khan built a resort at the same location and named it “Shangrila”. The plane was then turned into a coffee shop. The coffee shop is open from the end of March until the end of October every year and closes during the harsh winters of Skardu. The coffee shop has become a unique tourist attraction in Gilgit-Baltistan and people visit it from all over the world – for the snacks and the amazing view. Have you been to this super cool coffee shop in Skardu?